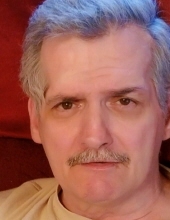 Johnny Wayne Keene, 61 years of age of Honaker, VA, passed away Saturday, December 1, 2018, at Russell County Medical Center, Lebanon, VA. Born July 6, 1957 in Welch, WV, he was the son of the late Joseph H. Keene and Deladess Wilson Keene. Johnny was a member of Harvest Outreach Church, a retired coal miner, enjoyed riding motorcycles, spending time with his family and singing his favorite song: Amazing Grace. A loving father, grandfather, brother, uncle and friend. In addition to his parents, he was preceded in death by his wife Debbie Keene, son Marty A. Keen, brother Grady D. Keen, infant brother Tommy L. Keen, sister Sandra G. Keene. Survivors include his daughter Kristy N. Keene of Richlands, VA; son Jerry D. Keene of Richlands, VA; sister Barbara Sue Bowman and husband Ferdie of Honaker, VA; brother B. J. Keene and wife Lois of Belfast, VA; several grandchildren, great grandchildren, nieces and nephews. Funeral service for Johnny Wayne Keene will be held at the Shortridge Ramey Funeral Home Chapel of Keen Mountain, VA, Wednesday, December 5, 2018 at 12:00 noon with Sister Brenda Blankenship officiating. Burial will follow in the Russell Memorial Cemetery, Lebanon, VA. Active pallbearers will be Chad Coleman, Billy Horton, Josh Johnson, Shane Osborne, Josh McClanahan and Johnothin Mitchell. Honorary pallbearer will be his family and friends. The family will receive friends at the Shortridge-Ramey Funeral Home Chapel of Keen Mountain, VA, Tuesday, December 4th, after 6:00 p.m. The family of Johnny Wayne Keene have entrusted the care of their loved one to Shortridge-Ramey Funeral Home of Keen Mountain, VA.
"Email Address" would like to share the life celebration of Johnny Wayne Keene. Click on the "link" to go to share a favorite memory or leave a condolence message for the family.